UPDATE: The NY Times Published transcribed excerpts of the interview with President Trump, they appear at the bottom of the post. Perhaps the most shocking part of President Trump’s interview with the NY Times is that he gave them the interview at all. 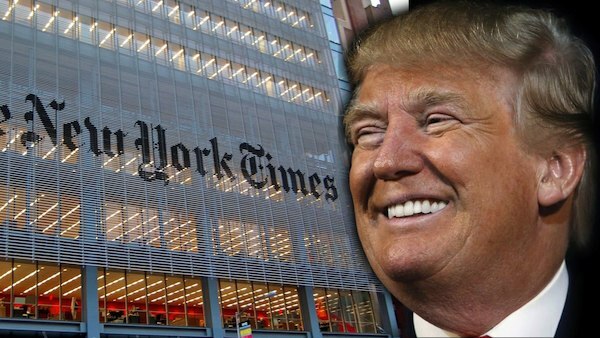 The NY Times is one of the vehicles the President calls “fake news.” A close second to the fact that he spoke to what he calls “The Failing NY Times” is the POTUS’ comment about Jeff Sessions. Trump told the paper that he’d never have appointed Jeff Sessions as Attorney General had he known Sessions would recuse himself from the Russia investigation. The president said sessions decision was “very unfair to the president”–it has slowed down his agenda. (…) Mr. Trump complained that Mr. Sessions’s decision ultimately led to the appointment of a special counsel that should not have happened. “Sessions should have never recused himself, and if he was going to recuse himself, he should have told me before he took the job and I would have picked somebody else,” Mr. Trump said. President Trump also went after former FBI director Comey, claiming the former lawman tried to leverage a dossier of compromising material to keep his job. Which means Comey learned a lot from J. Edgar Hoover. The president brought up Mueller’s office which he claimed loaded with people who had conflicts of Interests. The president also talked about what the media implied was a “secret” second meeting with Vladimir Putin during the G20 meetings. That supposedly “secret meeting” was held at a dinner attended by the President and First Lady, along with at least nineteen other couples and twenty translators. Couples were split up, and Mr. Trump sat next to Putin. The president went around the room to “schmooze” and spent sometime with Putin. Accordingly the media is freaking that he relied on a Russian translator to talk to Putin (the translator brought by the first couple was proficient in Japanese (each country was allowed to bring only one) as the POTUS was sitting near the Japanese Prime Minister and his wife. Mr. Trump said they talked for about 15 minutes, mostly about “pleasantries.” But Mr. Trump did say that they talked “about adoptions.” Mr. Putin banned American adoptions of Russian children in 2012 after the United States enacted sanctions on Russians accused of human rights abuses, an issue that remains a sore point in relations with Moscow. Heck, he did have all the opposition research necessary, all he really needed was a copy of Peter Schweizer’s book, Clinton Cash. The President wasn’t all negative, he made a joke about the famous long handshake with the French president and talk about the fact that unemployment has fallen and the stock markets have risen to record highs since he was inaugurated. The president added a new allegation against Mr. Comey, whose dismissal has become a central issue for critics who said it amounts to an attempt to obstruct the investigation into Russian meddling in last year’s election and any possible collusion with Mr. Trump’s team. The dossier didn’t bother Trump because he knew from the start that it was bogus. He also reminded the Times that just before he was appointed special prosecutor Muller interviewed for Comey’s job. Most of the Comey/Russia investigation discussion was nothing new, but the interview does seem to confirm earlier reports that President Trump was seething angry with A.G. Sessions for recusing himself. It will be interesting to see if there is fall out. The following are excerpts from that conversation, transcribed by The Times. It has been lightly edited for content and clarity, and omits several off-the-record comments and asides. Additional excerpts will be added as they are compiled. TRUMP: Yeah, what Jeff Sessions did was he recused himself right after, right after he became attorney general. And I said, “Why didn’t you tell me this before?” I would have — then I said, “Who’s your deputy?” So his deputy he hardly knew, and that’s Rosenstein, Rod Rosenstein, who is from Baltimore. There are very few Republicans in Baltimore, if any. So, he’s from Baltimore. Now, he, we went through a lot of things. We were interviewing replacements at the F.B.I. Did you know [Robert] Mueller was one of the people that was being interviewed? TRUMP: Look, there are so many conflicts that everybody has. Then Rosenstein becomes extremely angry because of [James B.] Comey’s Wednesday press conference, where he said that he would do the same thing he did a year ago with Hillary Clinton, and Rosenstein became extremely angry at that because, as a prosecutor, he knows that Comey did the wrong thing. Totally wrong thing. And he gives me a letter, O.K., he gives me a letter about Comey. And by the way, that was a tough letter, O.K. Now, perhaps I would have fired Comey anyway, and it certainly didn’t hurt to have the letter, O.K. But he gives me a very strong letter, and now he’s involved in the case. Well, that’s a conflict of interest. Do you know how many conflicts of interests there are? But then, then Comey also says that he did something in order to get the special prose— special counsel. He leaked. The reason he leaked. So, he illegally leaked.